, Cody Simpson and Tigerlily, secured through a partnership with the Unviersal Music Brand Partnerships Division. Outdoor advertising is also part of the deal, set to be established in areas considered likely to be highly visible to youth audiences. Coca-Cola has had a busy year in the Australian market. In June Coca-Cola began another huge marketing campaign surrounding the 100th anniversary of its “contour bottle” - a six month celebration of the iconic bottle in Australia which concluded with the arrival of a Bottle Art exhibition in Sydney in December after a tour of 15 countries. The multimillion-dollar campaign includes a new TV spot featuring the Pop Art images animated to a reworked version of Wham!’s hit ‘Wake Me Up Before You Go Go’. The campaign also involved major PR activity telling the contour bottle story through earned media, content pushed out through owned social channels and experiential work to round out the campaign. The innovative marketing push comes months after Coca-Cola grabbed attention by launching a natural sugar version of the drink, Coca Cola Life, only the fourth variant of the drink to be released in the company's 128 year history. That launch came as Coca Cola saw its sales of Diet Coke tank, particular in the US, as customers increasingly opted for more “fresh” drinks choices. Ads for this rolled out across TV, digital, cinema and mobile in April of this year. In May Credit Suisse suggested the roll out had resulted in fewer sales than initially projected, though a company spokesperson said the new variant had “exceeded expectations”. 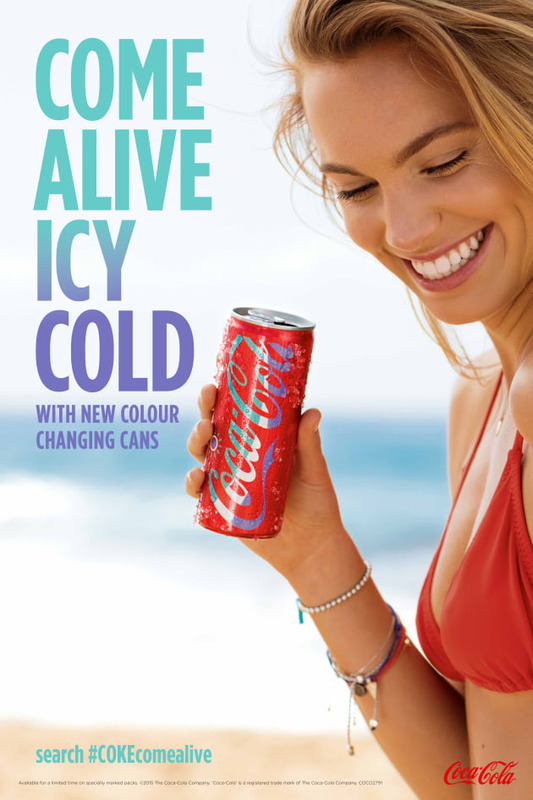 A major new integrated campaign being launched by Coca-Cola this summer will see the company push colour-changing packaging and image recognition technology. 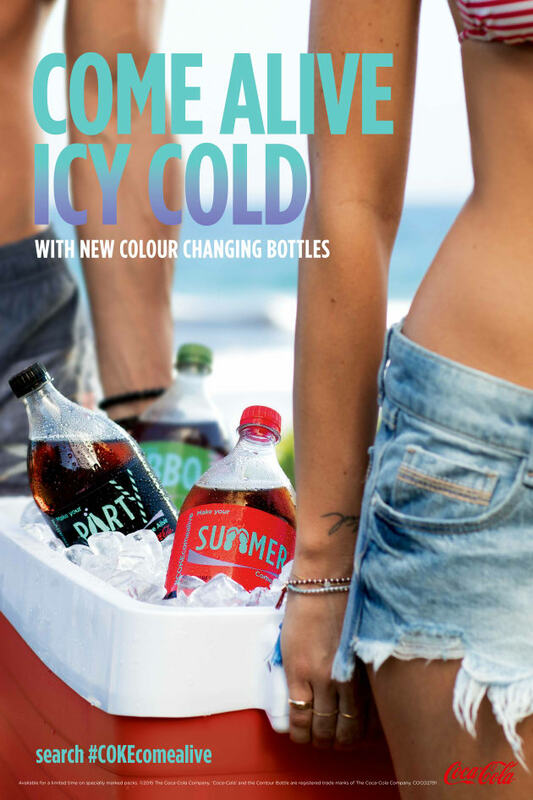 The multimillion-dollar summer marketing push by the global drinks giant's South Pacific arm is the latest evolution in the company's #Colouryoursummer campaign and targets the recruitment of new Coca-Cola drinkers and engagement with Coke “loyalists”. In particular, the brand is placing a major emphasis on drawing in new young drinkers. 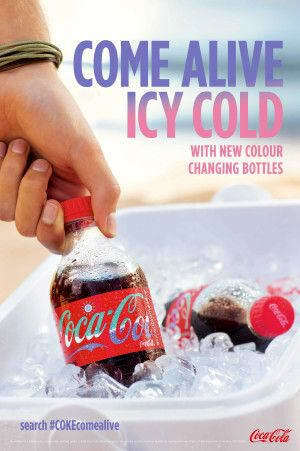 Temperature-controlled designs will feature on most packaging variants, allowing it to “come alive” with colour when it is chilled to the optimal drinking temperature. Consumers will be able to take a photo of their Coca Cola drink product and to “win unique experiences, content and more”, said the company. To drive the campaign Coca Cola is tapping into the energy around some of Australia's biggest teen celebrities, including Troye Sivan, Cody Simpson and Tigerlily, secured through a partnership with the Unviersal Music Brand Partnerships Division.